The Denver Broncos wanted Josh McDaniels to bring the New England Patriots' winning ways with him to the Rocky Mountains when they hired Bill Belichick's brash, young disciple 22 months ago. What they got instead was the ash-gray hoodie and their very own videotaping scandal to go with a pile of losses and personnel blunders that cost him his job not even halfway through his four-year contract. McDaniels was fired Monday in the midst of the franchise's worst skid in four decades. Running backs coach Eric Studesville will serve as interim coach for the final month, succeeding McDaniels, 34, whose hiring by team owner Pat Bowlen in January 2009 is now viewed as a big mistake. "My decision to relieve Josh McDaniels as head coach was not taken lightly. I will always be appreciative of his passion, enthusiasm and hard work, and I thank him for his efforts," Bowlen said in a statement after firing McDaniels with two years left on his contract. "In the end, I was not satisfied with the results and the direction this team was headed. The decision to make a change was extremely difficult but one that needed to be made for this organization and our fans," Bowlen added. "Everyone, myself included, is accountable for our disappointing season and is now responsible for restoring the culture of winning that has been established by this franchise. Our entire organization is completely focused on returning to the level of prosperity that our fans expect and deserve from the Denver Broncos." Players didn't know of McDaniels' firing when they left team headquarters after a conditioning run ended at 3 p.m. Shortly after that, McDaniels was called into Bowlen's office and fired. McDaniels then met with his assistants. The rest of his staff, including McDaniels' brother, Ben, who tutors the quarterbacks, will stay on for the final four games. "I am very grateful to Pat Bowlen and the Broncos organization for giving me the opportunity to be the head coach of such a proud franchise," McDaniels said in a statement released by the team. "I would like to thank all of the people who helped us over the last two years. I am especially appreciative of the efforts of every player, coach and member of the personnel department who worked so hard every day. I wish Pat Bowlen and the Broncos organization nothing but the best in the future." At his weekly news conference four hours before he was let go, McDaniels reiterated that he wasn't focused on his job being in jeopardy. "I'm not worried about that. I'm going to coach as hard as I can because that is my job and that's somebody else's decision," McDaniels said. Studesville and chief operating officer Joe Ellis will meet with the media Tuesday. There was no word on whether McDaniels would hold a farewell news conference. McDaniels becomes the third coach fired during the season, all in the past month. The Dallas Cowboys fired Wade Phillips on Nov. 8 and promoted Jason Garrett to interim coach, and two weeks later, the Minnesota Vikings fired Brad Childress and promoted Leslie Frazier to replace him. The two new coaches have a combined 5-1 record since taking over, and the Broncos (3-9) are hoping Studesville can inject some life into the team to close out this lost season. "I am very appreciative of the trust that Mr. Bowlen and the entire Denver Broncos organization have shown in me," Studesville said in a statement. "Although the circumstances that this opportunity resulted from are unfortunate, I am excited to lead this football team. We have a great group of players and coaches who are committed to finishing the season on a promising note and making our fans proud of this team." Studesville, 43, was in his first season in Denver after coaching the running backs in Buffalo from 2004-09 following a three-year stint (2001-03) in that same capacity with the New York Giants. 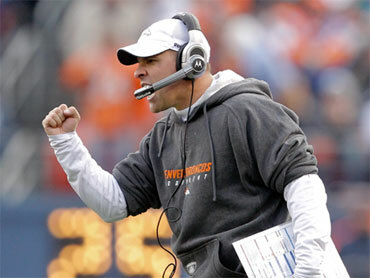 He began his NFL coaching career in 1997 with the Chicago Bears after working six years at the collegiate level. The players learned of McDaniels' firing via Twitter, where the Broncos announced it, and text messages. "Guys are trying to figure out if it's true, if it's not true, what's going on," wide receiver Brandon Lloyd said on his weekly radio show on Sports Radio 104.3 The Fan in Denver. Running back Lance Ball tweeted: "this the closest thing to Obama being elected president!!!" "It's tough. He's not out there playing," wide receiver Eddie Royal said. "The guys in the locker room have got to feel somewhat responsible. We didn't play well enough to win these games. We haven't had a good year. We haven't played the way we should have. Our fans are upset, and I can understand that. We've got a lot better football team than we've shown this year." Even though the Broncos are mired in their worst stretch since 1971-72, the timing of McDaniels' firing caught everyone off guard. "I didn't think it was going to happen," Lloyd said. "Come the offseason, yeah, anything can happen. They shuffle players, shuffle coaches. At this point in the season, I did not see that coming." McDaniels had nearly $7 million left on his contract, and Bowlen is still on the hook for millions more he owes Mike Shanahan, whom he fired last year. That means he'll be paying three head coaches next season unless the organization decides to withhold McDaniels' salaries for 2011 and '12 based on a violation of his deal, such as a morals clause. After winning his first six games his rookie season, McDaniels lost 17 of his last 22 with the Broncos in his first NFL head coaching job. He had plenty of off-the-field issues, too, including linebacker D.J. Williams' drunken driving charge that caused him to get stripped of his captaincy. Before he was fired Monday, McDaniels said he was reticent to turn to raw rookie quarterback Tim Tebow even though the Broncos had been eliminated from contention with a 10-6 loss at Kansas City, their seventh loss in eight games. McDaniels made a series of personnel decisions that backfired, notably trading away Peyton Hillis, who has become a power running back in Cleveland. He also let go of Casey Wiegmann, who's anchoring the league's top rushing attack in Kansas City. After beefing up both lines in the offseason, the Broncos rank 29th in the league in rushing offense and next-to-last in run defense. His biggest blunder might have been the hiring of videographer Steve Scarnecchia, who violated league rules by videotaping a San Francisco 49ers practice in London on Oct. 30. McDaniels was fined $50,000 by the NFL for failing to report the transgression. With thousands of empty seats at their last home game, the Broncos didn't announce actual attendance but only paid attendance, which at 72,736 was the lowest since Invesco Field opened a decade ago. By the time the Broncos' fourth-quarter rally fell one drive short in their 36-33 loss to St. Louis, the stadium was mostly empty.